The Spriggan is an unpleasant cousin of the Gnome. Ordinarily it appears as a short, bony, jaundiced humanoid with dirty reddish hair and a wild beard. 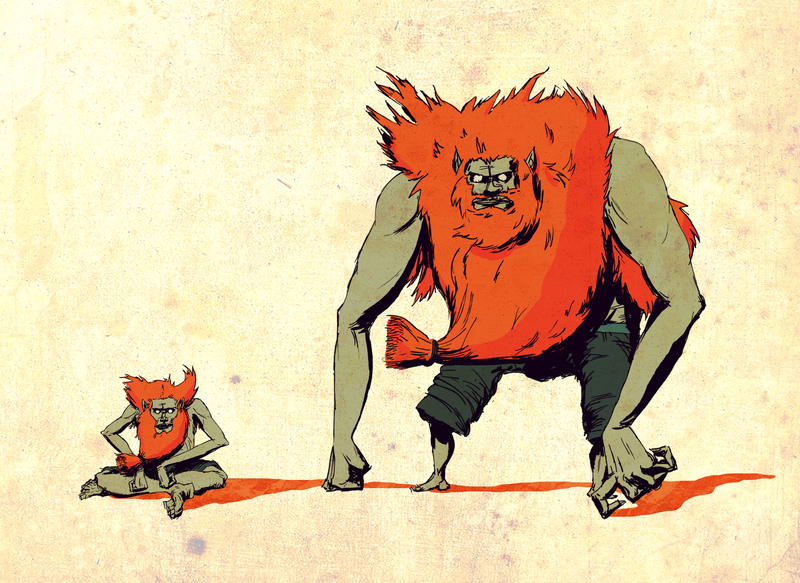 Size, particularly concerning facial hair, is of paramount importance in Spriggan Society - presumably to this end, Spriggans have gained the uncanny ability to enlarge their bodies to thrice their usual mass, becoming hulking, ungainly ogres in an instant. Their unusual versatility in this way gives them both the dexterity and brawn to be a sizeable nuisance to all around them, and their presence in any respectable society is cause for worry. Penned with a fineliner by hand, coloured in Photoshop. Massive beards are unhelpfully satisfying to draw. The Pixie is an interesting monster. 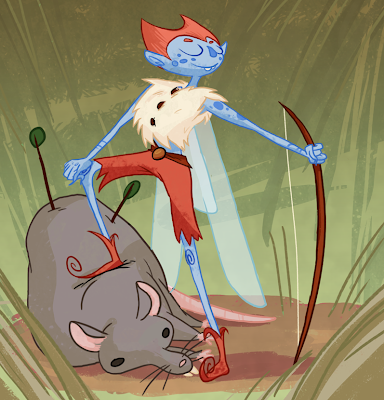 Small and mischevious, a pixie can turn itself invisible at will, and stay that way no matter what. It's got a large number of innate magical abilities, most of which are geared around disorienting the opponent, including a spell that makes the opponent dance uncontrollably. 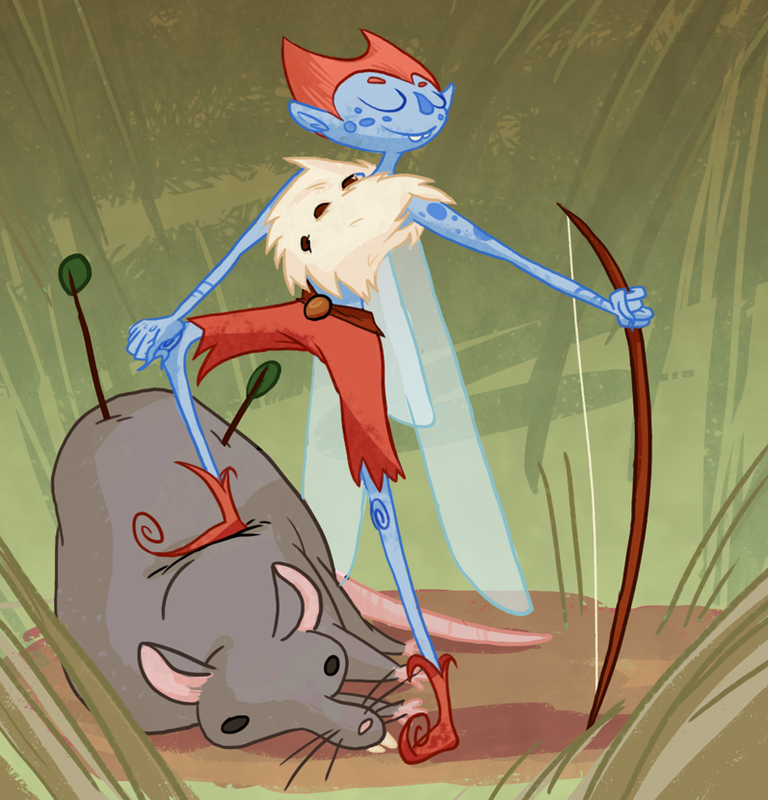 Its strength isn't combat; the arrows it shoots can cause sleep and memory loss. It takes four fourth-level characters to take down one pixie. That can't be good for an adventurer's self esteem. 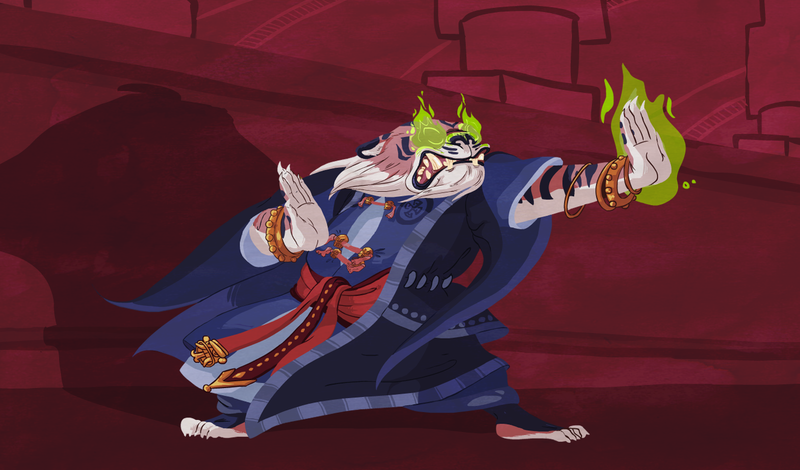 Rakshasa are a malicious breed of sorcerous shapeshifters. Their natural form is that of a bipedal tiger, but they can take on the appearance of any humanoid creature. They like to place themselves in positions which lets them rule over others. Their one downfall is their hands, which are reversed no matter what form they're in. Rakshasas are one of my favourite monsters. I like tigers, I like shapeshifters, and I like mythical creatures that have a tell when they're in different forms (like a vampire's lack of reflection, kitsune's fox shadow or the Devil's horns or hooves). The monster originally comes from Indian mythology, which can open up some interesting story paths. Plus there was always something that seemed strangely honorable about rakshasas, like they might not kill you if you genuinely impress them. The Desmodu are a race of subterranean bat-men. 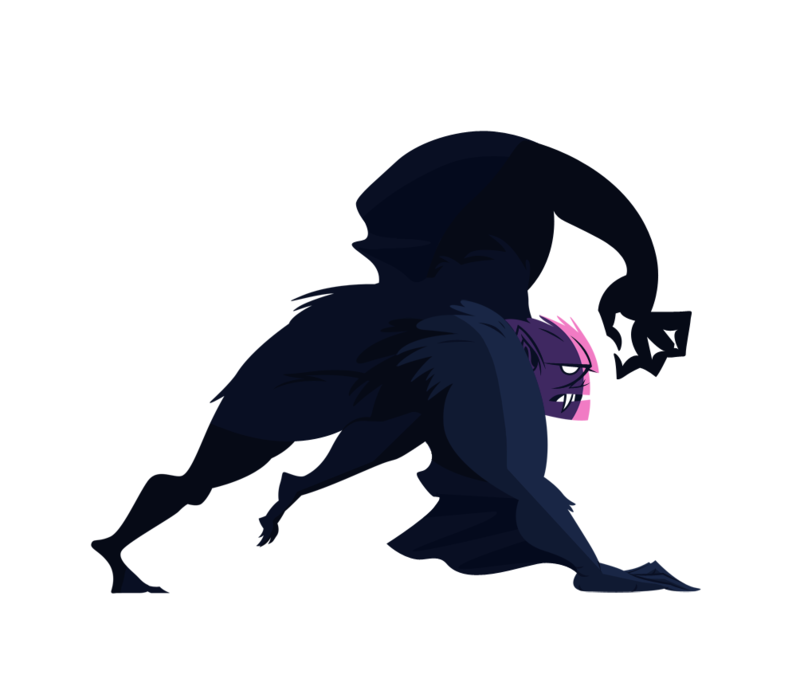 In contrast to their fearsome, apeish appearance, they are generally good-natured creatures who are more likely to help adventurers than eat them. Desmodu actually have a sort of reddish hue to their fur (as seen in some bats) but I favoured the bluer end of the spectrum to try and light a creature of darkness more convincingly. I consciously went for a Bruce Timm sort of thing with the style. The colour is obviously all vectors, which can make images look a little flat but is satisfying to be because it's one of the few ways I can "finish" a sketch and not feel like I've lost too much. Blanca's post will be a little late this week (tomorrow, probably) because she's in Spain. There will be no Dungeons & Drawings this week! Without seeming like passing the buck, this is almost entirely due to us moving house yesterday only to find half the floor was missing. Lord save us from builders with no sense of time management. We will be back on track next Sunday. The Gnoll is a hyena-like humanoid. They are brutal, dull-witted carnivores who form small societies together governed by their strongest and most evil. 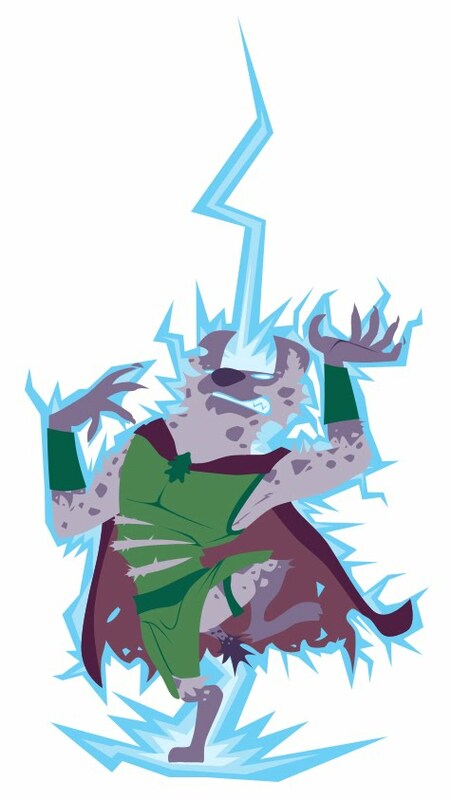 This is actually an image I made about two or three years ago, of a gnoll character I played. It inspired Joe to start this blog dedicated to D&D monster artwork. 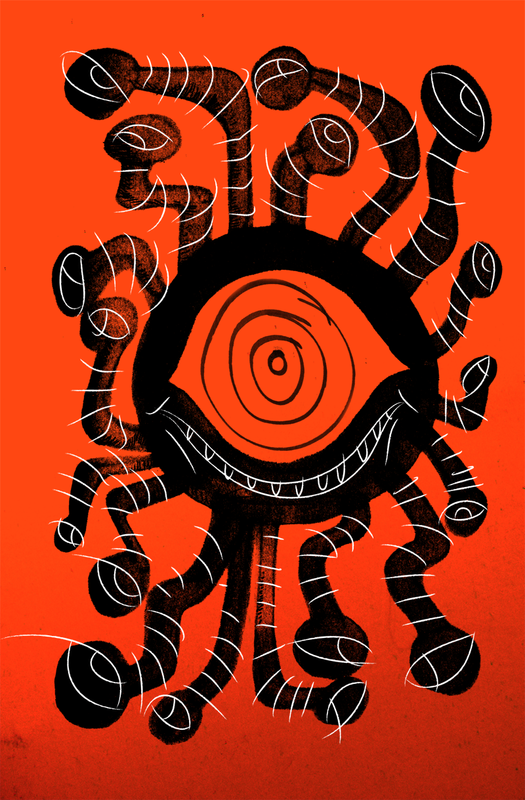 The Beholder is one of the most iconic monsters originating in Dungeons & Dragons. Its large, spherical body hovers over the ground, surrounded by a penumbra of snakelike eyestalks. Highly intelligent and utterly evil, the Beholder is one of the deadliest creatures an adventurer is likely to face. 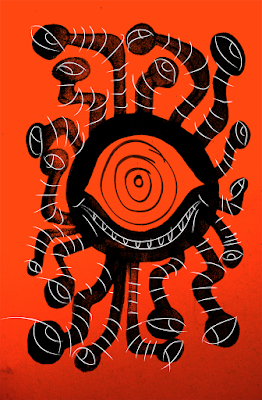 There isn't much anatomically going on with the beholder, so I thought I'd try a more abstract look. I started out going for a Keith Haring kind of thing but it ended up more Tim Biskup. 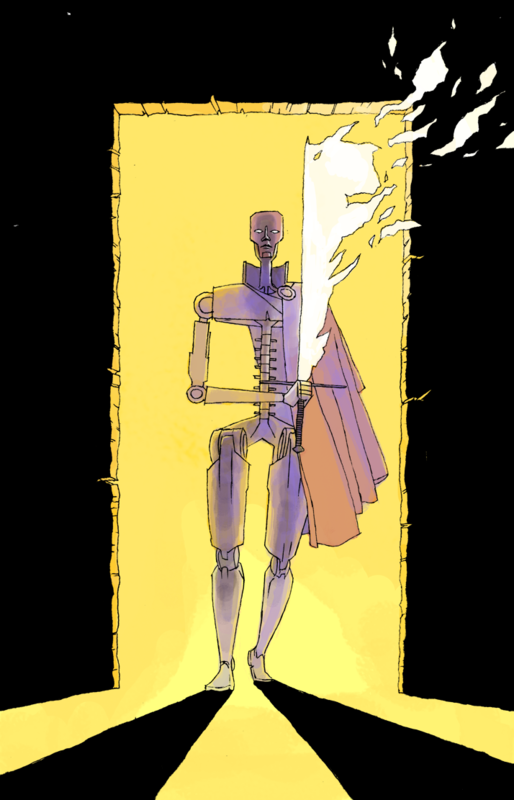 A Kolyarut is a clockwork knight from the plane of Mechanus, a dimension of severe, electronic order where magical machines rule. It is an agent of law and order whose sole purpose is the punishment of those who break contracts, oaths and bargains. A Kolyarut, once set in pursuit of an oathbreaker, relentlessly follows him or her across the planes until justice has been meted out. Traditional D&D lore gives the Kolyarut a romanesque feel, essentially making it into a robotic legionnaire with a bronze breastplate and flowing red capes. I wanted to make it simpler and scarier, paring it down to an almost skeletal form that seems deceptively delicate whilst still looking like something that would keep following you to the ends of the earth. Influenced by franco-belgian comic book artists like Moebius and Francois Schuiten. Check them out! The Krenshar is a deceptively intelligent feline creature. It hunts in packs, though its main strategy is for a lone scout to scare the prey towards the larger group by retracting the skin off its face and issuing a terrifying howl of almost supernatural ability. 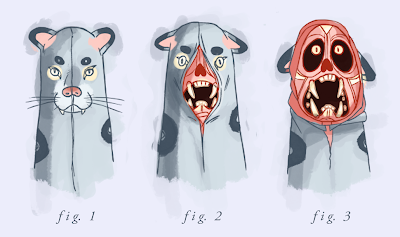 Deciding on the most appropriate way to display this creature's particular special talent was more difficult than it should have been, mostly because I didn't just want to show a stalking leopard-thing with a skinned face. Its a little bit dull, and the Monster Manual's already got dibs on that. The point of this project is to make illustrations different from your typical fantasy art style (though that's not to say that the typical fantasy style can't be amazing).